Tattoo is an art. It is an art for the canvas of human being. Tattoo is not uncommon thing now. We can see many kind of Tattoo in the world. Tattoo is not uncommon thing on my life. My father has Tattoo. My brother has tattoo too. It was not big change for me. One day in summer, I had Tattoo. One day in winter, I became Tattooist. 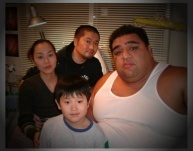 My son and Musashimaru OHANA means family. AKEBONO and I We are Islanders. And OHANA.
" Great Native American "
I dedicate it to my grandfather "Smith".